Implementing reform regarding the regulatory framework of the sector. Within the framework of the 2014-2020 Operational Program for Environment, the European Commission stipulated ex-ante conditions, requiring the Czech Republic to establish a regulatory office for the sector. Different alternatives are discussed at the governmental level, and regulatory impact assessment papers are being prepared. Facilitating sector strategic planning despite the heterogeneity of the utility ownership structure. Around 6,000 entities (owners, public services providers) operate in the water sector (Expert estimate). To some extent, the heterogeneity of those entities in terms of size, legal status, scope of competencies, and interests prevent effective strategic planning, resource balancing, and efficient asset management of regional systems, including drought and water scarcity issues management. MZe & MŽP. 2013. Report on Water Management in the Czech Republic 2013. Prague: Ministry of Agriculture & Ministry of Environment of the Czech Republic. MŽP. 2007. The Operational Environment Programme for the Period 2007-2013. Prague: Ministry of Environment of the Czech Republic. Economy. The Czech Republic, an EU member since May 2004, is a stable and prosperous market economy. With a per capita GDP of $27,344 (in current international dollars), the Czech Republic is considered a high-income country and belongs to the most developed economies in Europe. The country has a population of more than 10.5 million, and a population density of 136 inhabitants/km2. Seventy-three percent live in urban areas (World Bank 2015). While Czech socioeconomic inequalities are not great, the unemployment rate is estimated at around 7% (World Bank 2015), and approximately 9% of the population lives below the national poverty line (World Bank 2015). The Roma are considered a vulnerable minority; the official number of Roma is 0.13% of the population (CZSO 2013), which is far below the estimated real number of 1.4 to 2.8% of the population (ERRC 2013). Governance. The Czech Republic is a unitary state and is divided into 14 regions (13 regions and the City of Prague). The regional authorities also perform state administration. There are 6,253 municipalities, which are the smallest territorial units (comprising one or several villages). Of this number, 205 have extended powers and perform state administration at the local level (CZSO 2015). The central authority for water management is in the Ministry of Agriculture (including water supply and sewerage services). Regional authorities perform state administration of water management. Infrastructure is mostly owned by municipalities. Towns and villages are the lowest level of self-government, and they are responsible for provision of public services. Water resources. The Czech Republic is a landlocked country, and all its water flows out of the country into neighboring states. Therefore, renewable water sources are totally dependent on atmospheric precipitation. Average volume of total renewable water resources (surface water sources and usable groundwater sources) is 1,234 m3 per capita per year (FAO Aquastat 2015). According to the Falkenmark indicator, this average volume corresponds to a situation of “water stress” which, in the case of Czech Republic, is compensated by water intakes from rivers. The Czech Republic belongs to 3 international basins (the Elbe, Oder, and Danube); 63.4% of the territory (western part) belongs to the Elbe River basin, 9.2% is located in the northern part of Moravia and is part of the Oder River basin, and 27.4% is situated southeast in Moravia and belongs to the Danube River basin (MZe & MŽP 2006). The River Basin Management Plan became a mandatory basis to compile the river sub-basin management plans in accordance with Water Framework Directive (WFD) requirements. The entire country is classified as a “sensitive area” under the EU Urban Wastewater Treatment Directive. The Czech government approved the National Program to Mitigate Climate Change Impacts, and the country has gone to great effort to implement water anti-erosion measures and to improve the water regime and water management in the country. Water supply sources. Drinking water comes ground sources. Watercourse and water resources management has been based on hydrologic basins since the 1940s, making water resources management in the Czech Republic, including planning, fully in compliance with the global trend toward Integrated Water Resources Management (IWRM). Principles of water management are contained in the government’s 2007 Main River Basins Management Plan of the Czech Republic. Anyone who extracts surface water or groundwater must obtain a permit from the water authority. Payments and charges for surface water extraction, including the mechanism of payment, are mandated by law. Anyone who discharges wastewater into surface water or groundwater must also obtain a permit from the water authority. Compliance with permit conditions is overseen by the river basin manager or water authority that issued the permit, under the supervision of the Czech Environmental Inspectorate. Sanctions can be imposed for noncompliance. Service provision. Municipalities as owners of assets are responsible for provision of public water services. 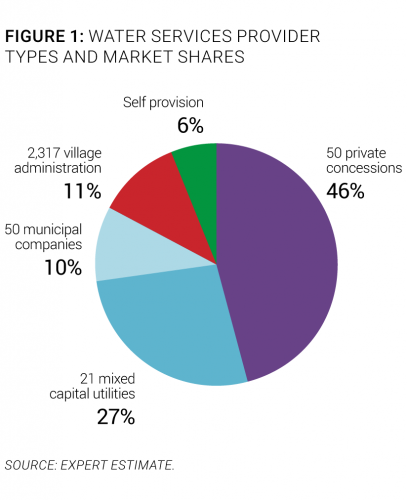 Figure 1 shows water service providers by type and market share. The most dominant operating model is a private concession (46% of the population) in the form of a “separate model” based on long-term operating contracts. Mixed capital utilities (which provide services to 27% of the population), refers to utilities that operate and own infrastructure. Municipalities, as in other countries in the Danube region, are shareholders in the utility and provide service to 10% of the population. 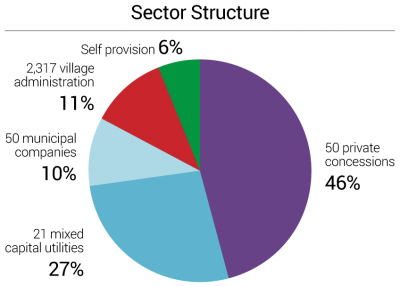 Village administrations (departments or public services) provide water services to 11% of the population, and around 6% of the population operate their own wells or water sources. More than 95% of utilities provide both water and wastewater services. The private sector is represented by multinational groups such as Veolia (France), Suez Environment (France), Aqualia (Spain), and Energie AG (Austria). Due to previous privatization processes, however, Spanish and Japanese shareholders are also involved in mixed models and therefore operate and own infrastructure, as well (Expert estimate). The Ministry of Agriculture, which is the line ministry in charge of water sector policy; water resources management; river basin management; watercourses and major water supply reservoirs management; and regulation of drinking water supply, sewerage, and wastewater treatment. The ministry also regulates water services quality. The Ministry of Environment, which is responsible for protection of surface and groundwater from pollution, and regulation of wastewater discharges. The Ministry of Finance, which provides regulation and control over surface water fees and water and wastewater tariffs. The National Institute of Public Health, which is responsible for drinking water quality control. Capacity and training. Large utilities are key players in staff capacity building. International groups (Veolia, Suez, Aqualia, Energie AG) that are involved in the Czech water sector also play an important role in developing staff training for all levels of managers through well-established human resources principles. Some utilities cooperate with universities in studies and pilot projects, and many use specialized agencies to provide professional trainings for their staff. Many utilities went through vocational training supported by EU grants. The Water Supply and Sewerage Association of the Czech Republic (SOVAK CR) organizes courses and conferences on water-sector-related topics. Czech utilities are generally considered to be stable employers, and technical staff turnover is relatively low. Municipal political cycles may sometimes influence top-level management staff. Economic regulation. The water sector is regulated by the Ministry of Finance according to binding rules and conditions established for tariff calculation, and monitors compliance through its regional financial authorities. The provider is entitled to include in the draft tariff “economically justified costs” and “reasonable profit.” “Economically justified costs” are costs directly associated with the operating activities and the renewal of infrastructure. “Reasonable profit” is profit providing an adequate return on invested capital and generating resources for renewal and development of water infrastructure. Tariffs are usually calculated on an annual basis. The utility submits the tariff proposals to the owner of the infrastructure, which then approves the new tariff for a particular year. Tariffs apply to all customers within a given tariff area. Infrastructure owners in a separate operating model implementing EU projects (under OPE) are obliged to apply the “financial model” for tariff setting. Regional financial authorities provide formal and factual control of tariffs in utilities (sometimes in-depth), and breach of financial rules is subject to penalties. SVS (Severočeská water company), a joint-stock company in which all the shares are held by municipalities from the region, owns the water and wastewater infrastructure in the North Bohemian region. It has formulated a long-term strategy for asset renewal, and for quality and technical standards for its infrastructure. It is active in the field of water management and communicates effectively with both municipalities and the public (http://www.svs.cz/en/). Ongoing or planned reforms. Discussions regarding the reform of the regulatory framework of the Czech water sector are underway. The Czech water supply and sanitation sector is fragmented into thousands of entities (owners and utilities) providing or operating public water services. Nevertheless, the sector is efficient because the 50 largest utilities provide services to around 90% of the population (Expert estimate). The EU OPE 2007-2013 introduced principles (concession contract modification, financial model for tariff setting) for municipalities that applied for co-financing of their infrastructure projects. The European Commission stipulated ex-ante conditions within the OPE for 2014-2020, requiring the Czech Republic to establish a regulatory office for the sector. Different alternatives are discussed at the governmental level, and regulatory impact assessment papers are being prepared. A decision is expected in the near future. Service coverage. The population of the Czech Republic has full access to water and sanitation services. Ninety-four percent of the population is connected to public water systems, and the rest use their own wells. Around 83% of the population is connected to public sewerage systems (Authors’ elaboration). Equity of access to services. The entire population has access to water and sanitation, regardless of social or ethnic status. This means that 100% of the poorest segment of the population (those living on less than $2.50 a day PPP) has access to piped water supply and flush toilets (Figure 3). Service infrastructure. Water and sanitation assets are in good condition due to considerable investment; however, aging infrastructure should be addressed in the near future. Operational conditions are considered satisfactory in terms of reliability and quality of service provided by utilities. However, even though huge investment expenditures were made in the last decade, a sustainable renewal rate has not been achieved yet. Infrastructure owners invested significant sums to meet environmental and drinking water standards. Some facilities are oversized due to decreasing water consumption. Aging of assets is becoming an issue for the infrastructure, which was built in the 1970s and 1980s. Quality of service. Quality of service in the Czech Republic is generally very good. Water supply is continuous 24/7 (IBNet 2015), with appropriate water pressure. The same goes for wastewater collection and treatment. Drinking water quality is fully in compliance with national and European standards. No water sample exceeding permissible limits was recorded in 2012. Less than 0.1% of customers living in very small settlements have been supplied with water benefiting from quality derogation (SZU 2014). The quality of wastewater discharged is monitored and independently measured by the authorities. Where effluent quality limits have not been met, penalties are applied. For some utilities, when operation management contracts have been concluded, a set of performance indicators have been defined in the contract and should be reported on by the operator. However, customers are not publicly informed about those indicators, and they are not displayed on the utility website. Customer satisfaction. Eighty-one percent of the population is satisfied with the service provided in their city (Gallup 2013). This number is significantly higher than in most countries in the region. Customer satisfaction surveys are not carried out at the national level. Some utilities provide a satisfaction survey themselves or through specialized firms and publish concise outcomes on their websites, mostly showing positive results. Most information is publicly available. However, data are mainly summarized, so obtaining specific details is occasionally difficult. For example, only a summary of an overview of tariffs is available. Overall efficiency. The efficiency of Czech water and sanitation utilities is relatively high and is based on the usage of modern techniques, procedures, equipment, commercial practices, and significant investments in infrastructure. It could be that the involvement of international operators in the large Czech utilities led to overall improvement of the sector. Overall efficiency is naturally much higher in larger utilities and there are also regional differences deriving from geographic and physical conditions. There are 5.2 employees per 1,000 connections (IBNet 2015), which is into among Danube best practice. Recent trends. All indicators show that the efficiency of the sector and of individual utilities has risen over the last two decades. The collection ratio is relatively high (ranging from 95% to 97%) and stable, regardless of small fluctuations in recent years (IBNet 2015). Utilities faced challenges that pushed them to be more efficient. On the one hand, average national water consumption dropped over the last 10 years from 103 liters per capita per day (l/capita/day) to 87 l/capita/day (CZSO 2015). On the other hand, tariffs increased 80-fold over the last 23 years (Expert estimate). Overall sector financing. 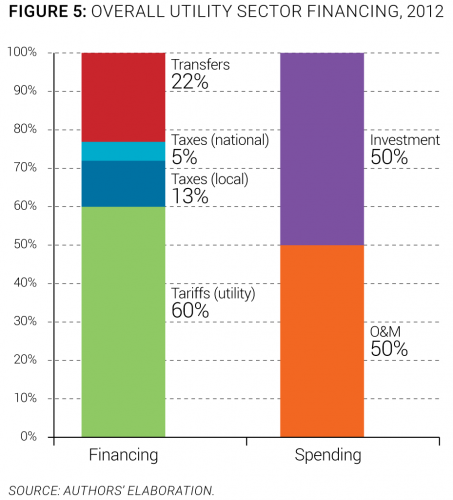 Tariffs are the largest financing source for the sector (Figure 5). Some villages or small municipalities support their utility operations with funding from their municipal budgets in order to keep tariffs affordable. Such subsidies are currently estimated to represent up to 5% to 10% of total utility operational expenditures (Expert estimate). Utilities receive no subsidies or additional taxes or fees to cover their operations and maintenance costs. Infrastructure owners force utilities to maximize rent, which is paid for use of the infrastructure. Rent and national and international subsidies are used only for infrastructure asset renewal and investment. Fees (water discharge, water extraction) and taxes are redistributed through the State Environmental Fund to be invested in infrastructure. 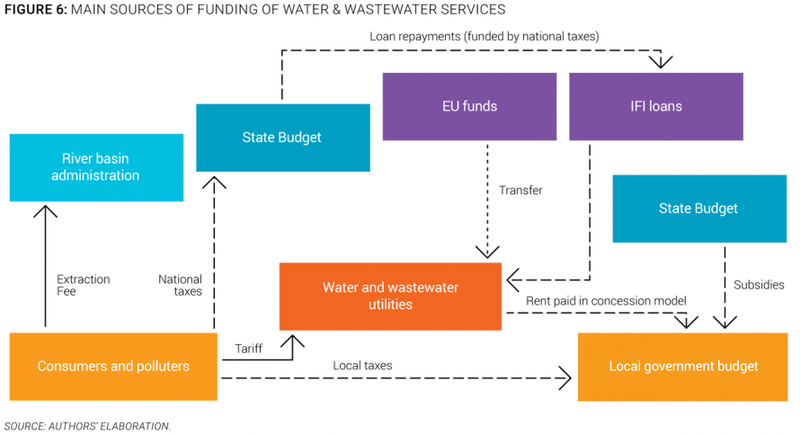 The main sources of funding of water and wastewater utilities are described in Figure 6, using the OECD three Ts methodology (tariffs, transfers, and taxes). Investment needs. The Czech Republic has already complied with EU water and wastewater directives. Future priorities will be ensuring a smooth supply of good-quality drinking water to residents and other customers, and effective sewage disposal, and sustainable services through reliable infrastructure based on affordable tariffs with minimal support from public finance. About €49 per inhabitant per year until 2022 would be sufficient to achieve the Czech National Strategy objectives (Expert estimate). Investments. The investment rate allocated for infrastructure expenditure is very high. Around €62 per person is invested every year in infrastructure (Authors’ elaboration). Investments are targeted to meet European/Czech standards, with 78% of investment going to wastewater management (Authors’ elaboration). Tariffs are the basic funding source for investments, supplemented with EU funds and state subsidies, which play an important role. Infrastructure owners also co-finance projects from traditional commercial loans, but only in justified cases and to optimize available means and investment priorities. The rate of investment over previous years has been relatively stable (Figure 7). Cost recovery. The Czech water policy includes a strategic objective to achieve “full cost recovery for WSS,” with reference to the requirements of Article 9 of the WFD. The level of “cost recovery for the WSS” is assessed in the economic analysis of river basin management plans under the WFD, together with the “polluter pays” principle. Service providers receive no national or international subsidies to recover operating costs. Nevertheless, to keep tariffs affordable, some villages and small municipalities support their utility operation with municipal budget funds of up to 5 to 10% of total operating expenditures (Expert estimate). However, financial authorities may apply penalties in such cases. The Act on Water and Wastewater Systems and Price does not allow cross-subsidies between residential and industrial tariffs. The Statutory City of Brno and Brněnské vodárny a kanalizace (BVK) structured and implemented the reconstruction project of a 500,000 p.e. per wastewater treatment plant, which was co-financed by a €75 million European Bank for Reconstruction and Development (EBRD) loan. The BVK utility was the borrower, and two major shareholders (Statutory City of Brno and Suez Environment company) provided loan guarantees, including guarantees for project completion (capital increases, pledge of shares, pledge of property, etc). The project was successfully completed in 2005, both on time and on budget (http://www.bvk.cz/en/about-company/waste-water-treatment/brno-modrice-wwtp/). Tariffs. There is only one tariff for households and industries, and cross-subsidies are not permitted. Tariffs have gradually and continuously increased, in real terms, for more than two decades, and the national average water price exceeds €2.50/m3 (MZe 2014). Regional differences exist, and the highest tariffs already exceeded 100 CZK, or €3.6/m3 (MZe 2014). Current tariff levels result from massive investments made over the last 20 years to pay for the more than 2,000 new wastewater treatment plants built, and the 25,000 km of new sewer pipes laid to meet environmental standards (Expert estimate). Tariffs are also high due to the high fixed costs of the sector, and the decrease in water consumption. Tariffs are expected to continue to increase over the next few years as increasing attention is paid to renewing existing facilities. Affordability. 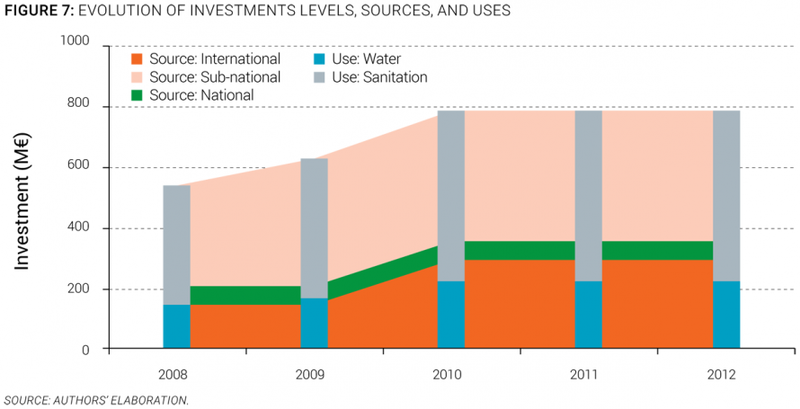 In 2012, water and sanitation services remained affordable at 2% of average household income. The social affordability threshold is set at 2%, and is reviewed by the State Environmental Fund under projects co-financed by EU funds. A methodology, including affordability limits, has been published for all regions of the country. For households in the bottom 40%, however, water and sanitation expenditure potentially represents on average up to 2.8% of income (Authors’ elaboration). To evaluate and reflect the sustainability of services in the region, an overall sector sustainability assessment was done taking into account four main dimensions: access to services, quality of services, efficiency of services, and financing of services. Each of these dimensions is measured through three simple and objective indicators. For each indicator, best practice values are established by looking at the best performers in the region, and countries closest to those best performers are deemed to have a more mature sector. A more complete description of the methodology to assess the sector sustainability is included in the Annex of the State of the Sector Regional Report from the Danube Water Program. 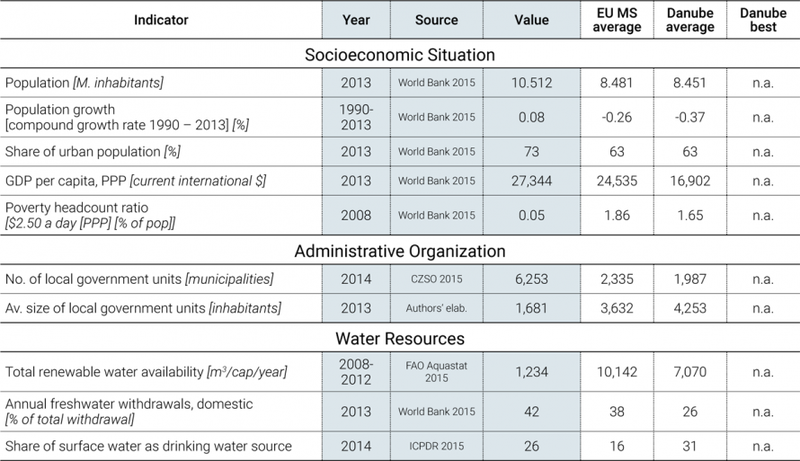 The outcomes of this assessment for the Czech Republic water sector are displayed in Figure 9, which also shows average and best practices in the Danube region. The Czech sector sustainability score is 88, which is much higher than the Danube average sector sustainability of 64, and is among the best practices in the region. The assessment shows that, on average, the country performs very well in terms of access to piped water and flush toilets, continuity of service, wastewater compliance, staffing level, collection ratio, and nonrevenue water. The main deficiencies of the Czech water sector identified through the sector sustainability assessment are operating cost ratio and affordability (Figure 9). Facilitating sector strategic planning despite the heterogeneity of the utility ownership structure. Around 6,000 entities (owners, public services providers) operate in the water sector (Expert estimate). To some extent, the heterogeneity of those entities in terms of size, legal status, scope of competencies, and interests prevent effective strategic planning, resource balancing, and efficient asset management of regional systems, including drought and water scarcity issues management. Addressing this situation could help implement more efficient sector planning. CZSO. 2013. Census 2011. Prague: Czech Statistical Office. —. 2015. Czech Statistical Office. Accessed 2015. http://www.czso.cz. ERRC. 2013. Czech Republic - A Report by the European Roma Rights Centre - Country Profile 2011-2012. Budapest: European Roma Rights Centre. MZe & MŽP. 2006. River Basin Planning - Working proposal on Environmental Impact Assessment. Prague: Ministry of Agriculture & Ministry of Enviroment of the Czech Republic. —. 2013. Report on Water Management in the Czech Republic 2013. Prague: Ministry of Agriculture & Ministry of Environment of the Czech Republic. MZe. 2014. Report on Water and Wastewater Systems in the Czech Republic 2013. Prague: Ministry of Agriculture of the Czech Republic. SZU. 2014. Annual Report on Water Quality 2013. Prague: National Institut of Public Health of the Czech Republic. This note has been prepared by Miroslav Klos, local consultant, with the support of Maria Salvetti, consultant, and David Michaud, World Bank, based on the data collection by Miroslav Klos. It is part of a regional State of the Sector review led by David Michaud, World Bank, under the Danube Water Program financed by the Austrian Ministry of Finance, whose support is gratefully acknowledged. The authors welcome comments and can be contacted through David Michaud (dmichaud@worldbank.org).